Blanton Forest is located on Pine Mountain in Harlan County and is the largest old growth forest known in Kentucky. Trees that tower 100 feet above the forest floor are the same ones the settlers saw as they came through the Cumberland Gap and moved westward into Kentucky in the 1700s. The forest is a union of past and present, one of the rare places where nature's scheme has gone unchallenged and unexploited. Several distinct natural communities are found in Blanton Forest. The most diverse of these is the mixed mesophytic forest, one of the most diverse temperate zone forest in the world. This forest typically includes a variety of canopy trees such as sugar maple, beech, tulip poplar, basswood, hemlock, and several species of oaks and magnolias. It is found on moist, rich slopes and in some ravines. 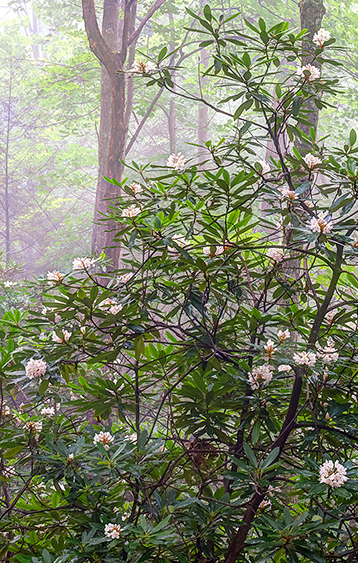 The larger ravines, or hollows, support a hemlock-dominated forest with a dense understory of rhododendrons. Drier sites on ridges support chestnut oak dominated forests as well as oak-pine forests. Small open seeps, often called bogs or mires are filled with sphagnum moss, cinnamon ferns and wildflowers. They are located in the heads of some hollows on the south face of the mountain. Watts Creek, a stream within the preserve that supports a population of the federally threatened fish, blackside dace, begins in one of these seeps. Blanton Forest is named in honor of former owners Grover and Oxie Blanton. The Blantons purchased the land in 1928 and passed it on to their daughters with the understanding that it would never be logged. The Blanton family’s desire to protect the forest forever was fulfilled when the two parcels containing the old growth were acquired and dedicated as Blanton Forest State Nature Preserves. 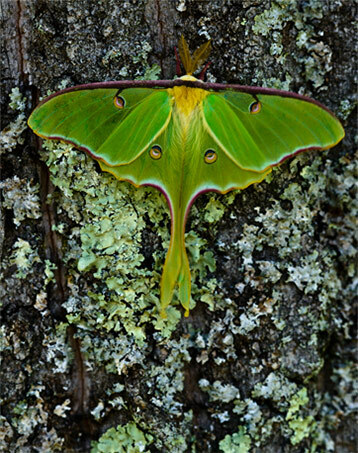 KNLT formed in 1995 and launched the effort to protect Blanton Forest. A preserve design of nearly 7,000 acres was developed that includes buffer lands necessary to protect the 2,200 acres of old growth forest. Today Blanton Forest State Nature Preserve is 3,510 acres and continues to grow with KNLT's assistance. Currently KNLT owns and protects an additional 1,016 acres adjacent to the preserve. Nearly 2,500 acres of the preserve design are still in need of protection. KNLT’s Forest Steward works in collaboration with Kentucky State Nature Preserves Commission (KSNPC) staff to manage the forest and trail network. 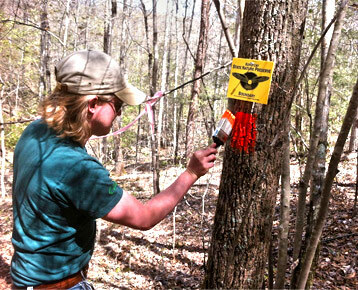 Boundary monitoring, invasive species control and trail maintenance are a major focus of stewardship activities. Blanton Forest is the largest state nature preserve in the state and is a popular destination for hikers. KNLT has established a stewardship endowment to generate the income needed to protect and preserve the forest for years to come. This fund provides for active management and protection of the rich and diverse forest communities. Additional staff will be needed as additional lands is acquired, increase educational program offerings and facilitate research needs. Invasive species are one of the most significant threats to Blanton Forest. These non-native species kill and out compete native species which impact the overall health of the ecosystem. One of the most serious threats is the hemlock woolly adelgid, a tiny insect from Asia that feeds on the needles of hemlocks and eventually kills the trees. In 2008 KNLT and KSNPC helped launch Save Kentucky’s Hemlocks, a movement aimed at coordinating hemlock treatments and spreading awareness. The program is now part of the Kentucky Division of Forestry and KNLT continues to work as a partner to treat hemlocks along Pine Mountain. Blanton Forest State Nature Preserve is located in southeastern Kentucky approximately five miles west of the city of Harlan. From Interstate 75, take exit 29 onto U.S. Hwy 25E at Corbin. Travel south on U.S. 25E to Pineville. Turn left on U.S. Hwy 119 (crossing the Cumberland River) and travel north for 23.5 miles. Turn left on KY 840 at a sign for Camp Blanton. Follow KY 840 for approximately 2 miles; the parking area for the preserve is adjacent to Camp Blanton. The preserve is open every day starting at sunrise. It closes at sunset. Darkness closes in quickly once the sunsets. Please allow enough time to complete your hike. 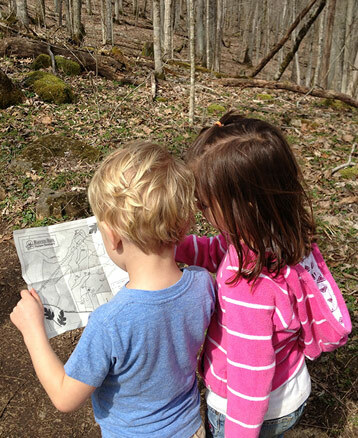 Before heading out on your hike, please take a moment to orient yourself to the trail system. Please note that all trails are open to foot traffic only. To protect fragile resources and for your own safety, visitors must remain on the designated trails at all times. Please be aware that there are hazardous cliffs along the trails and you may encounter venomous snakes. A trail system approximately 4.5 miles in length is open for public use. The main trail consists of two loops leading to points of interest on the south face of Pine Mountain. The E. Lucy Braun Memorial Trail is named in honor of the Cincinnati, Ohio ecologist who studied and documented the old growth forests of Eastern Kentucky in the 1930’s. Dr. Braun was a champion for preserving natural areas throughout her life. Both loops of this trail offer a chance to see the old growth trees and experience the rich diversity of Pine Mountain. From the KNLT parking lot, visitors walk up the gravel road to the trailhead. The moderate Knobby Rock Loop includes a large sandstone rock outcrop with a bird’s eye view of the mountains. The Sand Cave Loop is more strenuous and leads through a maze of jumbled sandstone blocks to a spectacular sandstone rock shelter. The easy walk along the Watts Creek Trail is a good way to see towering hemlocks and experience the solitude of the forest. The spur trail segment that runs along the banks of Watts Creek is not a loop trail, and you must return on the same path. 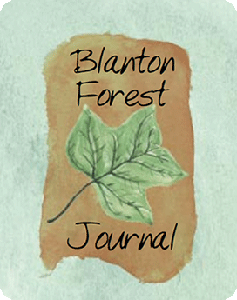 The Blanton Forest Journal was developed for the original campaign to protect the old growth tracts of the forest. Special thanks to James Archambeault, Wendell Berry, Joy Ripper, Pam Spaulding, Judy Hensley’s students at Wallins Elementary and all the groups and individuals who contributed to this journal. Text and design by Mountain Association for Community Economic Development.